The color combination in this is a lot more subdued than I wanted, but it's got a kind of antique look to it, IRL, and the colors are clearer. I really wanted to use the Large Paper Doily Sizzlit, so I pretty much worked this around that element. 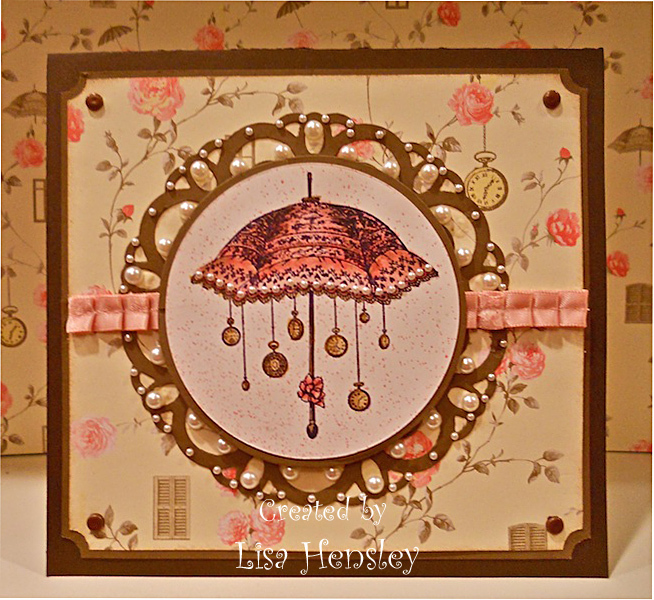 Things you may or may not see: I used the new Pink Pirouette Smooch Spray on the umbrella image -- I really love the color! The edge of the umbrella, as well as the Doily, have about 86,000 Pearl Jewels. Again, something that is much prettier IRL! All products are SU! unless otherwise noted. Apothecary Art and Attic Boutique dsp!